It's more visually appealing than a desk built into a computer described in text, but other than that, I think I like John Brunner's version better. We enjoy the design of the Apple computer range, though on a functional level, PC is preferred. So we designed a desk/computer as beautiful as a Mac but easily upgradeable like a PC. 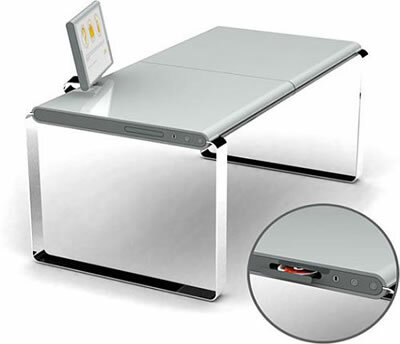 All computer components and cable management is contained within the thickness of the desk, and when upgrading is required, the desk lid simply flips open. CDRW/DVD, USB and Hot Keys are located on the side of the desk. Readers might also remember the desk from Tron, the 1982 film featuring a great mock-up of this concept. From XYZ computer desk via Born Rich.